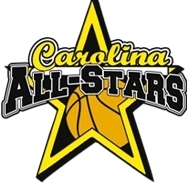 Carolina All-Stars Girls Basketball will hold 2019 Team Final Tryouts on Sunday, March 10, 2019 from 2:00 - 4:00 pm (9th - 11th Grade) and 4:00 - 6:00 pm (5th - 8th Grade) at Chapel Hill High School, 1709 High School Road, Chapel Hill, NC. THE CORE MEMBERS FOR EACH OF OUR TEAMS HAVE SELECTED, HOWEVER, WE WILL ADD TALENTED PLAYERS THROUGH 2019 SEASON FINAL TRYOUTS HELD ON SUNDAY, MARCH 10, 2019 from 2:00 - 4:00 pm (9th - 11th Grade) and 4:00 - 6:00 pm (5th - 8th Grade). PLEASE E-MAIL COACH TY COX at coachcox@carolinallstars.com with the following information as soon as possible to express your interest - Name, School, Class, GPA, ACT/SAT score, Height, Position, 18-19 scoring avg., 18-19 rebounding avg., 18-19 steals avg., 18-19 assists avg., college's of interest, parent's name, parent & player contact phone numbers and parent & player contact e-mail addresses. You may also reach Coach Cox by phone at (919) 641-7172. Our Season will be from February to October leading up to the beginning of the players 2019-2020 school season. Our teams will be very competitive and we will challenge our players against some the best players in the country. Furthermore, we will expose our players to over 500 college coach recruiters throughout the 2019 Season. This will allow us to receive the proper evaluation from college recruiters at various levels (Division I, II, III & NAIA) to help all our players improve. Our travel teams will work to perform successfully on the court as a team. However, our travel team will be focused on complete player development to assist each player in reaching their full potential. We want all our players to compete successfully at the high school varsity level, therefore, increasing their opportunities to play college basketball. This year’s experience will give parents and parents a glimpse into the process of player development, the college recruiting process and the world of high level competitive basketball. The Carolina All-Stars Travel Team Program is the extra edge for those parents and players who wish to develop to the best of their ability. As there are special schools, elite academies and tutors for students, the Carolina All-Stars is a program to ensure proper development and opportunity for the player. We recognize that there may smaller, less-competitive and more convenient programs but being a part of the Carolina All-Stars is a special effort for that special player. High School Player Workouts for 15U, 16U & 17U Travel Exposure Teams will be begin in February at the conclusion of the high school regular season. Times and locations will be posted soon. Players who have not completed their high school season CANNOT participate in workouts, however, it is recommended that they attend one of the workouts to speak with the coaching staff about the teams and playing opportunities. This team is primarily for starters at the high school varsity level during the 2018-2019 high school season who wish to increase their skills in order to become more college recruitable prospects. This team is for players that wish to continue their basketball career on the college level. Players must be committed to putting in the work necessary in order to take their games to the next level. The team will compete at the highest level nationally. This team is primarily for 10th grade starters at the high school varsity level during the 2018-2019 high school season who wish to increase their skills in order to become more college recruitable prospects. This team is for players that wish to continue their basketball career on the college level. Players must be committed to putting in the work necessary in order to take their games to the next level. The team will compete at the highest level nationally. This team is primarily for 9th graders that are JV starters or key contributors at the varsity level during the 2018-2019 high school season who wish to increase their skills in order to become varsity starters as sophomores on their high school teams next season. Players on this team have committed this off-season to improving their game in order to become college prospects. The team will compete at the highest level nationally. Some players on the national team may play in selected tournaments with the regional team in order to provide more playing opportunities. Carolina All-Stars 14U (14-U) This team is primarily for 8th graders that desire to play at the varsity level during the 2019-2020 high school season who wish to increase their skills in order to become varsity players as freshmen on their high school teams next season. Players on this team have committed this off-season to improving their game in order to become college prospects. The team will compete at the highest level nationally. Some players on the national team may play in selected tournaments with the regional team in order to provide more playing opportunities. Carolina All-Stars 13U (13-U) This team is primarily for 7th graders that desire to be middle school starters and key contributers during the 2019-2020 middle school season. Players on this team have committed this off-season to improving their game in order to become college prospects. The team will compete at the highest level nationally. Some players on the national team may play in selected tournaments with the regional team in order to provide more playing opportunities. Carolina All-Stars 12U (12-U) This team is primarily for 6th graders that desire to be middle school starters and key contributers during the 2019-2020 middle school season. Players on this team have committed this off-season to improving their game in order to become college prospects. The team will compete at the highest level nationally. Some players on the national team may play in selected tournaments with the regional team in order to provide more playing opportunities. Carolina All-Stars 11U (11-U) This team is primarily for 5th graders that desire to be middle school starters and key contributers during the 2019-2020 middle school season. Players on this team have committed this off-season to improving their game in order to become college prospects. The team will compete at the highest level nationally. Some players on the national team may play in selected tournaments with the regional team in order to provide more playing opportunities.